As you may already know, my dearest husband has been struggling to come to terms with my recent crochet creations... the crochet coasters and granny bunting have been met with shocked looks and deep sighs, and I have even started to doubt my own sanity and sense of style. 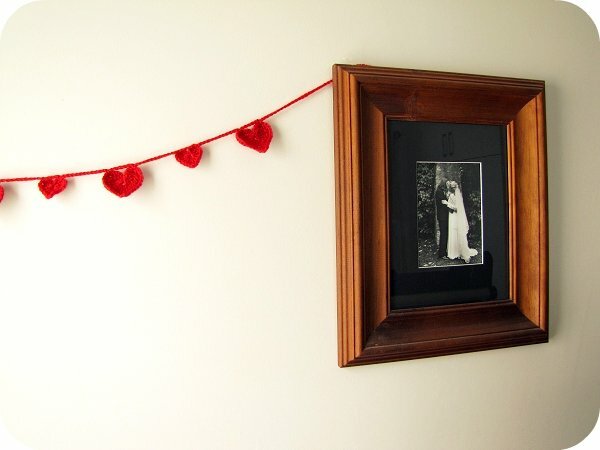 After creating the last lot of granny bunting, I declared that I would be off to make him a string to hang in his car... and I kept my word, but decided to make him a chain of hearts instead (what, with Valentines day not too long ago and our wedding anniversary in April, I though it was the perfect symbol of true love). As you can see in the photo below, he was lost for words... but I just knew he was overcome with love and deeply moved by my sacrifice of time and effort put into this display of love (and probably struggling with a hint of envy for my fine crochet skills as well). I love you too babe... and let me know anytime if you ever want a matching string for the back window as well. That is priceless...isn't it great to have a blog to record such moments in family life. Oh yeah I love the bunting...mine hangs in our living room. OH that is so AWESOME!!! I am just about falling off the chair laughing!! Of course he is totally impressed.. i think his hand was over his face because he was thinking, how will I ever match this outpouring of love by my wife, she has far superior crochet skills, what can I do that will come close to this? Love, love, love this! HOW FUNNY! Congratulations on the anniversary celebration&creativity, Kristy! 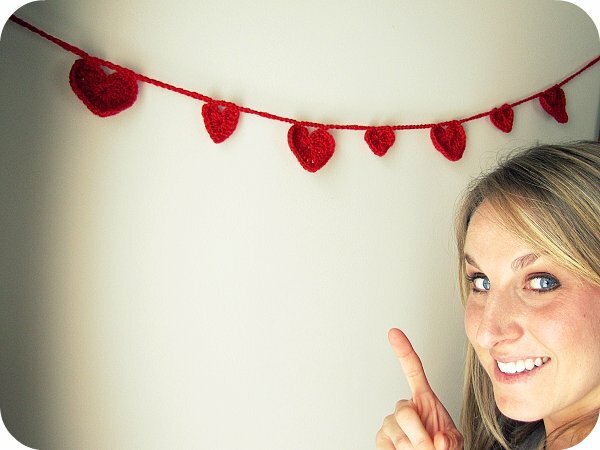 Those yarn hearts are so sweet. Handmade gifts are extra sweet because of all the time you put into making it, and how that time is spent thinking of the lucky person receiving it :) You two are rare wonders! Genius, just genius. What a priceless moment! okay your stuff is ADORABLE!!!!!!!!!!! ha ha ha - that is awesome - I wish I could crochet! Oh yeah PS: happy anniversary!! Ha ha ha ha! LOVE it! i love his reaction! it's awesome. Awesome!!! You rock... you totally rock! bhhhaaaahhhaaaa. The cool bass playing surfer chick is long gone! Ha ha that is so awesome! So glad you went through with it! This has to be one of my favourite posts of yours so far. I do not mean to diminish the greatness of the others...this one is just...pure awesome. Love it, love it, love it - his face says it all :-)! you are a genius!! I so wish Jase was around so I could steal that idea!!! Just brilliant!! Tee hee! Glad to see I'm not the only one who drives my partner bonkers with all my creations!! After all his crazy antics I don't think he REALLYY has alot to say!!! I think your expression of love is gorgeous! And I just love your photo's too! he he he, thanks for putting a smile on my face. you are making great memories for your little family. My husband has much the same reaction to my crochet obsession. But he laughs and reckons whatever makes me happy. I love the photo of you husband in his car, so funny. Love it!! He is so overly overcome by emotion....I can tell. Your thoughtfulness, creativity, and acts of love have left him shaking his head over how he ever made you his wife! FYI: he needs one for the back and something for the antenna as well! Could you crochet a license plate cozy???? Awesome! :D And fantastic photos! Bahahahaaaaahahahahaah! Well that's what he gets for thinking your coasters were doillies! haha! 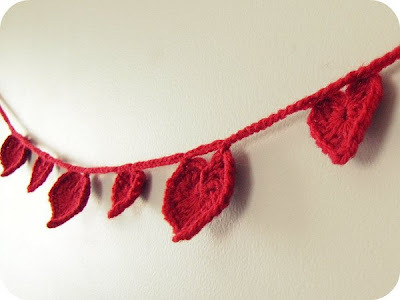 I love the heart bunting - so adorable. Awesome work I bet my hubby would be SO jealous!! Ha ha ha!!!!!! Totally cool, you egg! This is so cute! What a fun idea! Too, too funny! Your husband's expression looks just like my husband! Love the bunting and LOVE the photos! Too funny! My husband has a similar reaction every time I crochet. Your hearts are lovely. Bahahaha - I totally love it! Oh my heavens!! That is hilarious! Coffee! Out the nose! Snorted! What a lucky hubby!!! hahahaha Love them! he is lucky to have such a cute sassy wife. i am sure he knows that. Speechless is the work - although I can't make out if he is about to cry or laugh. Well done. So does he indeed want a matching one for the back window? You should make him crochet seat covers for the car, then he would really understand your love for him! Fantastic post! Hilarious!! Love the pic of hubby in his car. So good. Isn't family just great. Thanks for the giggle. I needed one today. Hahaha wonderful, my boyfriend can have that same look on his face when I offer new ideas like, hon, shall I make a matching granny square blanket for our orange car? I guess I just have to do it and pimp the car in the middle of the night while he's sleeping ;) love your blog & humor by the way! I did an inspired version of your hearts banner myself! Hahahaha this is actually hilarious - so so funny! He looks so impressed - am sure he's hoping you also do matching carseat head rest covers for him! Hilarious post! I want some hearts too! Not for my car though...but maybe for my bedroom! I went looking on your shop site even - but alas none...Pretty please!? !